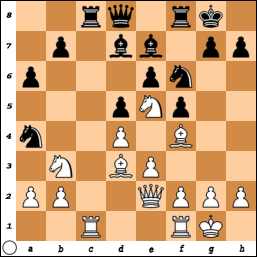 I recently came across a very nice example of White’s winning strategy in the Stonewall structure (Chapter 6). After a relatively subtle opening mistake Black was forced to lose control of the c-file and lost the game without a fight. Many games have reached this position, though in my opinion this is a somewhat inferior version of the Stonewall structure, since White’s bishops are very well placed on d3 and g5. 8…Nbd7?! a very questionable move! The option 8… Bd7 seems more reasonable. 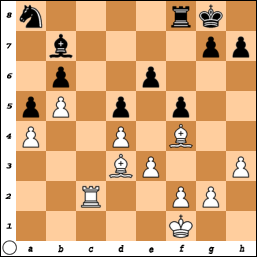 White already has a huge advantage, because he traded c-pawns and gained control of the c-file. Notice that Black’s knight is terribly placed on d7, if it were on c6 it would block the file for some time. 10…Nb6 11. Nb3 Na4 12. Qe2 Bd7 13. Bf4 Rc8 14. Ne5 a6? This move only weakens the b6-square. A better defense was 14… Rxc1 15. Rxc1 Be8. 15. Rxc8 Bxc8 16. Rc1 Bd6 17. h3 Qe7 18. Qc2 Nb6 19. Nc5! White creates pressure on the queenside, inviting Black to trade off some of the key defending pieces, like the bishop on d6. 19…Bxe5 in case of 19… Ne4!? 20. f3 Nf6 21. Bg5 White preserves a big edge, and ideas like Qb3 are available. White has traded all the key defending pieces and now Black’s position is hopeless because he does not have any realistic chances of counterplay. 23…Nd7 24. Rc3 Nb6 25. Kf1 Na4 26. Rc2 Nb6 27. b3! preparing an expansion with a2-a4-a5. 27…Na8 this move is a very sad necessity, to prevent White’s rook from entering the 7th-rank. In case of 27… Nd7 28. Rc7 Rd8 29. a4 White is nearly winning. The alternative was 28… a5 29. Rc5 b6 30. Rc6 Bd7 31. Rd6 Bc8 32. g4 !?. White has a clear advantage. 31. g4! claiming space on the kingside is the right approach to win the game. White aims to create a second weakness. 36. f3 Bb7 37. Kf4 threatening the Kg5-h6 invasion. 37…h6 38. h5! making use of the weakening move h7-h6. 40. Rc6 Bd7 or 40… fxg4 41. Bg6+ Ke7 42. fxg4 Bd7 43. Rc2 followed by Rf2 winning. 41. 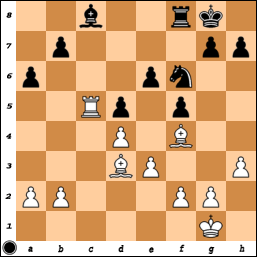 Rd6 Ke7 42. gxf5 Black resigned as his position has collapsed. 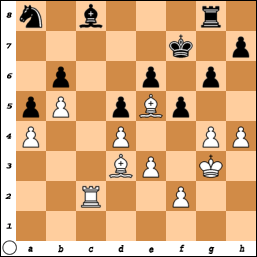 This game is yet another example of White’s dominance once the c-pawns have been traded, and the c-file is accessible. Ten moves were enough for White to secure an enduring positional advantage, and the rest of the game is just a visually pleasing positional massacre. Feel free to leave comments, suggestions or questions. If you liked this blog post, click “Follow” at the top of the page to receive an email once a new blog post is out. I will try to post once per week. This entry was posted in Uncategorized on May 18, 2015 by Mauricio Flores. Interesting post Mauricio, thanks for it. Is very impresive how Adreikin’s deeper knowledge is basically enough to win easily the game. 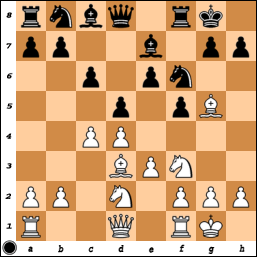 In any case, after watching the whole game, and consecuences of opening the c-file with 9…, cd5, wouldn’t be better to Cxd5? Hi Fer: I agree that …Nxd5 would have been a reasonable reply, but I didn’t analyze it because that pawn structure would be obviously inferior, since Black lacks central pawn breaks, and most importantly, the dark-squares would be weakened (such as e5) after the dark-squared bishops are traded. Many thanks for your instrutive answer! !